Differences between Martian meteorites and rocks examined by a NASA rover can be explained if Mars had an oxygen-rich atmosphere 4000 million years ago—well before the rise of atmospheric oxygen on Earth 2500 million years ago. Whilst it is possible that the geological composition of Mars varies immensely from region to region the researchers believe that it is more likely that the differences arise through a process known as subduction – in which material is recycled into the interior. They suggest that the Martian surface was oxidised very early in the history of the planet and that, through subduction, this oxygen-rich material was drawn into the shallow interior and recycled back to the surface during eruptions 4000 million years ago. The meteorites, by contrast, are much younger volcanic rocks that emerged from deeper within the planet and so were less influenced by this process. The discovery of manganese oxides in Martian rocks might tell us that the Red Planet was once more Earth-like than previously believed. A new paper in Geophysical Research Letters reveals that NASA’s Curiosity rover observed high levels of manganese oxides in Martian rocks, which could indicate that higher levels of atmospheric oxygen once existed on our neighboring planet. This hint of more oxygen in Mars’ early atmosphere adds to other Curiosity findings—such as evidence of ancient lakes—revealing how Earth-like our neighboring planet once was. Lanza uses the Los Alamos-developed ChemCam instrument that sits atop Curiosity to “zap” rocks on Mars and analyze their chemical make-up. This work stems from Los Alamos National Laboratory’s experience building and operating more than 500 spacecraft instruments for national defense, giving the Laboratory the expertise needed to develop discovery-driven instruments like ChemCam. In less than four years since landing on Mars, ChemCam has analyzed roughly 1,500 rock and soil samples. In the Earth’s geological record, the appearance of high concentrations of manganese is an important marker of a major shift in our atmosphere’s composition, from relatively low oxygen abundances to the oxygen-rich atmosphere we see today. The presence of the same types of materials on Mars suggests that something similar happened there. If that’s the case, how was that oxygen-rich environment formed? “One potential way that oxygen could have gotten into the Martian atmosphere is from the breakdown of water when Mars was losing its magnetic field,” said Lanza. “It’s thought that at this time in Mars’ history, water was much more abundant.” Yet without a protective magnetic field to shield the surface from ionizing radiation, that radiation started splitting water molecules into hydrogen and oxygen. Because of Mars’ relatively low gravity, it wasn’t able to hold onto the very light hydrogen atoms, but the heavier oxygen atoms remained behind. Much of this oxygen went into the rocks, leading to the rusty red dust that covers the surface today. While Mars’ famous red iron oxides require only a mildly oxidizing environment to form, manganese oxides require a strongly oxidizing environment. These results suggest that past conditions were far more oxidizing (oxygen-rich) than previously thought. “It’s hard to confirm whether this scenario for Martian atmospheric oxygen actually occurred,” Lanza added. “But it’s important to note that this idea represents a departure in our understanding for how planetary atmospheres might become oxygenated.” So far, abundant atmospheric oxygen has been treated as a so-called biosignature, or a sign of existing life. The next step in this work is for scientists to better understand the signatures of non-biogenic versus biogenic manganese, which is directly produced by microbes. If it’s possible to distinguish between manganese oxides produced by life and those produced in a non-biological setting, that knowledge can be directly applied to Martian manganese observations to better understand their origin. 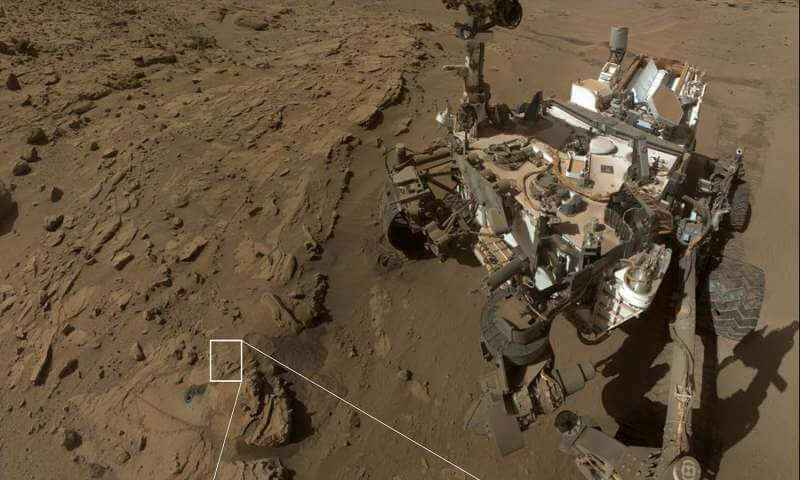 The high-manganese materials were found in mineral-filled cracks in sandstones in the Kimberley region of Gale crater, which the Curiosity rover has been exploring for the last four years. But that’s not the only place on Mars that abundant manganese has been found. The Opportunity rover, which has been exploring Mars since 2004, also recently discovered high-manganese deposits in its landing site thousands of miles from Curiosity, which supports the idea that the conditions needed to form these materials were present well beyond Gale crater.